The article was featured in the BMJ Research News and attracted international attention. 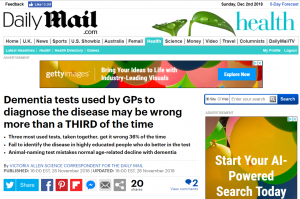 The title of the BMJ Research News article suggested that brief cognitive assessments often ‘misdiagnose’ dementia. We have asked the BMJ editors to change their title to ‘misclassify’ to avoid the suggestion that brief cognitive assessments should be used to diagnose dementia on their own. The study was supported by the Halpin Trust, the Mary Kinross Charitable Trust, the Engineering and Physical Sciences Research Council, and the U.K. National Institute for Health Research.